My friend Andy has many stories to tell. 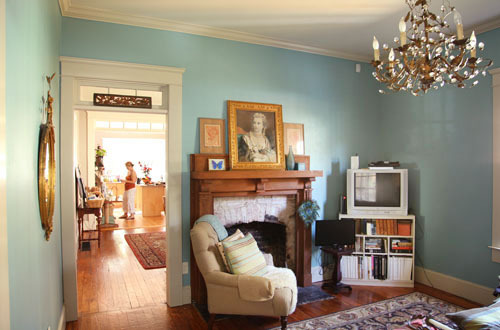 No matter which item you point to in her home, you'll likely get one of three answers; 1. "Oh I found that on the side of the road." 2. "I bought it at a thrift store" or 3. "That's my grandmother's." 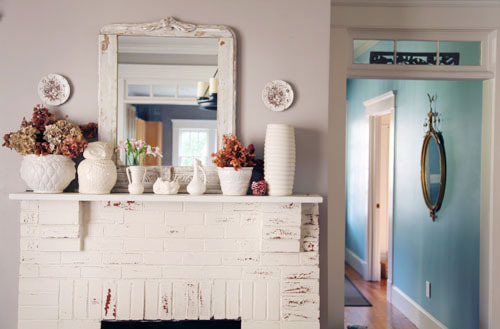 Her house is filled with great finds for little money but you'd never know it, as Andy's lovely East Atlanta bungalow oozes style, charm and good taste. Her mantel may be my favorite section of the house. 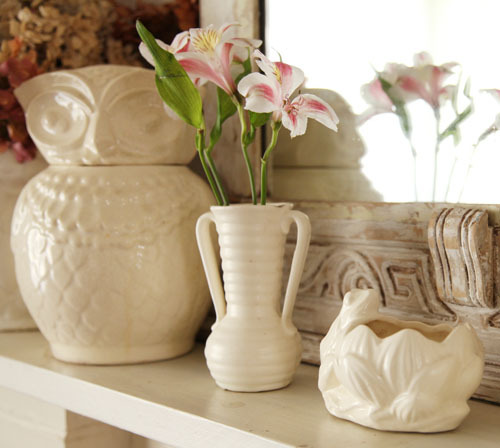 I love her finds in white placed atop the distressed fireplace. And the mirror and two sweet vintage plates make it the prettiest picture. Upon entering, you can tell this is a person's home who appreciates and deeply admires the work of artists. Andy has found a career in art design and her sister is a painter, as was her grandmother. The chandelier is from Ballard Designs. Original price was $600 but Andy found it on Ebay for $199. The sculpture was brought back from Italy from a family member in the 1970's and is called "The Three Graces." I love the far wall in her kitchen. The old shutters Andy found at Lakewood Antiques, (now defunct) and the flowered paintings were done by Atlanta artist, Michele Prahler, created on plywood with a mix of patterned paper and a sharpie. The child with orange hair is a painting by Alabama folk artist, Michael Banks. This old recipe box is from Andy's grandmother and is such a wonderful keepsake. It makes me think of my own mother's recipe box, and my grandmothers...it's just the way it was done and each card was written in script. Andy's bedroom has incredible natural light and warm toned blues and browns, my favorite combo. It's cozy here. This is one of the many projects Andy just completed. She had found this vanity on the side of the road and sanded it down before adding a thinned out mix of paint and water (she only used about 1/2 cup of paint) It's a perfect addition to her oh so charming front porch.